More and more states are approving both the medical and recreational use of cannabis for humans, but does marijuana have any benefits for cats? 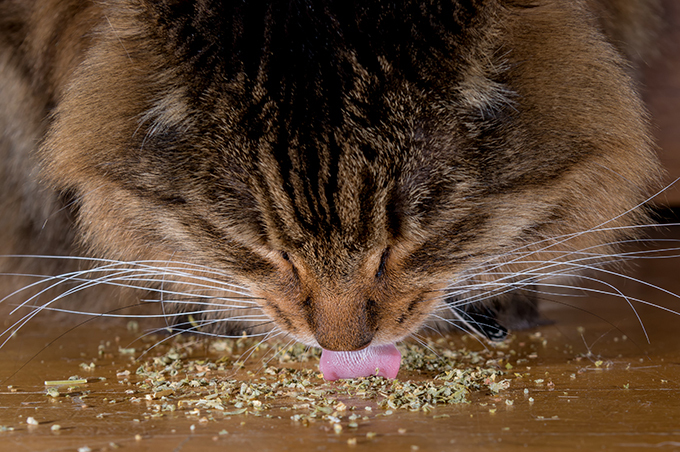 Many joke that catnip gives kitties a high similar to the one produced in humans, but cannabis doesn’t give cats the case of the zoomies or make them act silly – it may have therapeutic benefits. One active chemical in cannabis–cannabidiol, or CBD–is what humans use for medicinal purposes. Unlike another chemical in marijuana, Tetrahydrocannabinol (THC), CBD does not produce the high many associate with the plant. CBD is what many humans use for ailments like inflammation and anxiety, and pet owners are starting to see similar benefits for cats. Many pet owners are using hemp-derived CBD products to help their cats with everything from arthritis to epilepsy. Testimonies from customers of companies like Canna Pet sing the products’ praises. One cat, 10-year-old Maxie started a regimen of CBD supplements after traditional Western medicine wasn’t helping with her urinary tract infections or advanced kidney disease. Maxie’s owner claimed the supplements helped with Maxie’s urgency involving urination and soothed her so she could get the proper amount of rest. Holistic veterinarians are recommending CBD more and more, too. Dr. Angie Krause, a holistic veterinarian in Boulder, Colorado, has been using CBD products on her patients for years and is impressed with how positively it has affected their quality of life. While she is an advocate of CBD, she does warn that cat owners should be selective when purchasing CBD products. She suggests that potential buyers know the farming practices of the supplier; how the CBD oil was extracted; the concentration of the CBD oil in the product; testing of the product that guarantees no THC got in; what other ingredients are in the product; and the terpene and flavanoid (two more components of cannabis that have medical benefits) levels of the product. While some veterinarians have collected anecdotal successes, there are still not many official studies documenting the effects of CBD on cats. With all of the hype surrounding CBD oil and other CBD products for cats, it might be worth the medical community’s time and money to continue studying the compound’s possible benefits. For example, researchers discovered that CBD helped alleviate nausea in rats–whose to say it may not have a similar, clinical affect on cats? If you are considering giving you cat cannabis, it’s important you don’t self-administer cannabis you would buy for human consumption. 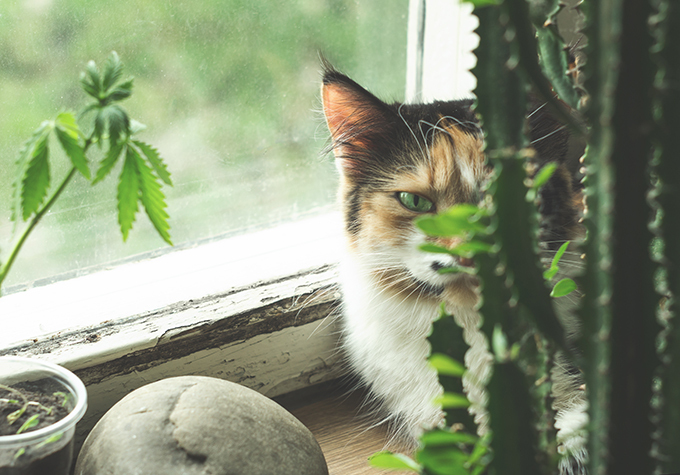 Pet poisoning by marijuana is on the rise, and if you just let your cat chew on some pot like you would catnip, it could have lethal results – THC is toxic to both cats and dogs. Be sure to talk to your vet and come up with a treatment plan for your cat, and make sure any CBD product you want to administer doesn’t have any interactions with any other medications your cat might be on.